Find hotel near Aero Space Museum Of Calg .. 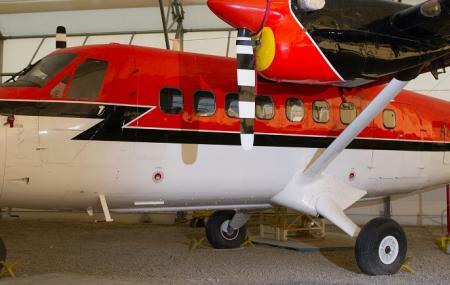 The Aero Space Museum of Calgary is dedicated to the preservation of Western Canadian Aviation History. It has a collection of over 20 aircrafts. These include 1936 WACO EQC-6 Custom WACO 10 Cabin Series, full size replica of AEA Silver Dart, AVRO 652 Anson Mk. II, Barkley Grow T8P-1 and Bell 47G to name a few. Trivia- The building in which the museum is based used to be a drill hall for #37 Secondary Flight Training School. Student (12 to 17 years or with valid student ID card) - $7 Family - $25 Includes 2 adults and 4 children (17 year and under). The Museum may be closed for private events on some days. How popular is Aero Space Museum Of Calgary? People normally club together Telus Spark and The Calgary Zoo while planning their visit to Aero Space Museum Of Calgary. Interesting if you like old aircraft. Staff friendly and helpful. Handicap access is moderately difficult. Great place if your a grade 6 student or teacher it is an awesome place to field trip. If you at all are interested in Canadian flight history you will love it even more. I'll be back there. Very cool and interesting history!! There are historical airplanes from Canada and Alberta. Had a tour with some very knowledgeable men that gave us awesome information. A very cool museum to check out aircrafts and engines from way back in the day and from WWII. You can walk about the museum and learn about western Canadian aviation. They also showcase different aviation-related artifacts and we were even able check out the interior of some of their aircrafts. Definitely something worth checking out in Calgary! This museum has a lot to offer... If you love aviation and the history behind these early 1900’s air crafts like fighter jets and bombers to helicopters like the bubble chopper seen on the 70’s sitcom M*A*S*H*, you are in for a treat!! An amazing interpretive and historical aviation museum in Calgary, AB is a great tourist attraction for the aviation enthusiast!